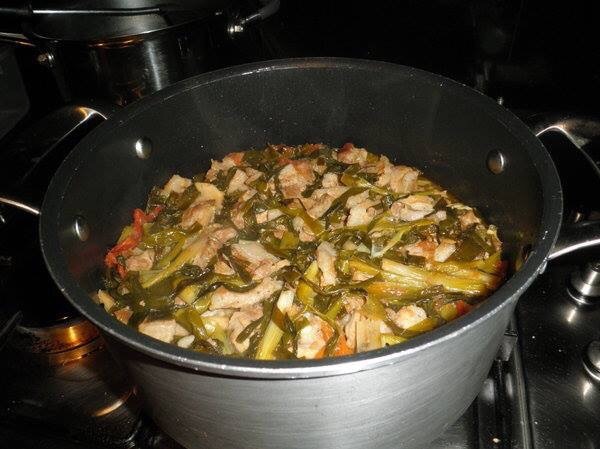 I love this dish as it represents my heritage and well one of the simplest to cook. It uses the layering technique and then on to the stove with lid on and simmering until cooked. In the Northern parts of Viet Nam food is not in abundance as the Southern parts .It’s cold and no Mekong Delta and its rich silt . Dishes in the North are often made by adding bits to the main ingredient to stretch it a little to feed the whole family . There’s a saying that some of the Northerners are so poor that they’d carve a board into a shape of a fish and dip it into fish sauce to eat with rice. 3/ 4-5 Trevally cutlets enough to line the pot . 9/ drizzle of fish sauce and some sugar to taste, simmer with lid partly on until fish is cooked. May need to add more tea, not too much as it is not a watery dish..most of the water should have been gone by the time it is finished. The dish should be salty to have with rice.. The belly pork adds a bit of fat..the tea takes away the fishy smell..can add chilli to the pot for some heat..if you like it hot..
Next Next post: How Sweet?